I taught K-12 general, vocal and instrumental music, as well as high school music theory and history at Will Carleton Academy from 2007-12. 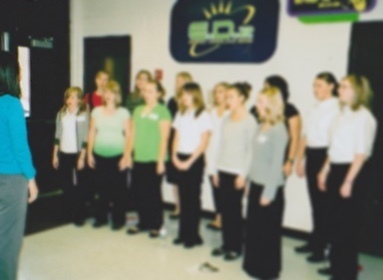 My student teaching experience focused on general and vocal music at Onsted Public Schools in 2006. For more information, please view my ​​​​ CV . Pictured: I'm helping middle school students warm-up for MI Honors Choir audtions. I taught K-2 general music in MI as the primary music teacher in MI. In NY, I acted as a model and supervising teacher for junior student teachers with K-2 children. While a graduate student in PA, I provided music for Kindergarten children at a local childcare facility and organized teaching music leading opportunities for preservice elementary general classroom teachers. As an assistant professor at Ithaca College in NY, I provided music to preschool children in Head Start and also organized experiences for preservice music teachers to lead music-making opportunities in those settings as well. In addition to these teaching experiences, I continue my education in this area. I have completed Music Together and Kodály Level 1 training.